The global hot stamping foils market was valued at US$ 6,514.05 Mn in 2017 and is anticipated to expand at a CAGR of 3.5% from 2018 to 2026, according to a new report titled ‘Hot Stamping Foils Market: Global Industry Analysis, Size, Share, Growth, Trends, and Forecast, 2018–2026,’ published by Transparency Market Research (TMR). The global hot stamping foils market is driven by rise in the demand for hologram foils. Europe accounts for a major share of the global market due to increase in investments in technological advancements in end-user industries in the region. The pharmaceutical segment accounts for a major share of the global hot stamping foils market. Medical-grade hot stamping foils are used for printing on infusion bags, drug covers, and medical devices. These foils provide pharmaceutical products with a unique identity and help differentiate them from genuine products. New technologies have been introduced for incorporating QR codes and barcodes in holograms. QR codes and barcodes contain secure information required for identification of products. Using them along with holograms is expected to promote a more secure method of encapsulating information. Hot-stamped holographic films have significant potential for application in this field. Rising need to make currency notes and other financial and legal transactions more secure and reliable has led to the introduction of holograms, which are difficult to imitate. High-security foil patches are applied on currency notes. With rise in global population, access to credit cards and debit cards is expected to increase. This is anticipated to drive the demand for holograms during the forecast period, which is likely to present growth opportunities to the global hot stamping foils market. Hot stamping foils are used for marking security features on paper currency to differentiate fake notes from genuine ones and prevent counterfeiting of currency. The segment is expected to lose market share during the forecast period, due to steps such as demonetization and transition to cashless economy in developing countries such as India. Based on product, the global hot stamping foils market has been segmented into metallic foils, pigment foils, hologram foils, and specialty foils. Of these, metallic foils is the most widely used product type. Pigment foils is the most versatile product type of hot stamping foils. However, the pigment foils segment is likely to lose market share during the forecast period. The hologram foils segment is estimated to expand at a rapid pace during the forecast period. Hologram foils are used to make holograms on products for identification of the product and its brand and for marking the product as authentic and genuine. Hot-stamped holograms are found on the packaging of confectioneries, cosmetics, automotive parts, textiles, and similar merchandised items. They are also used for making holograms on credit and debit cards and important government documents for the purpose of security and prevention of counterfeiting. 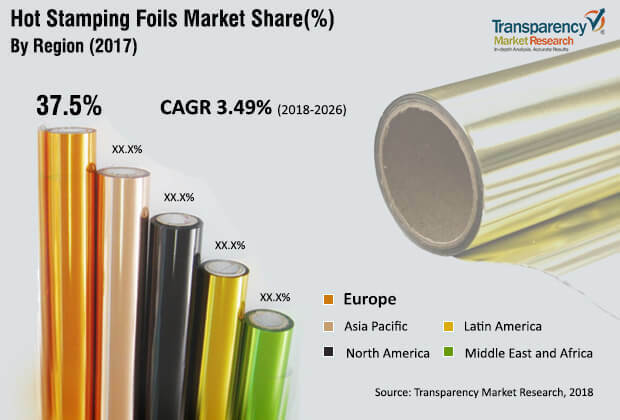 In terms of carrier film, the global hot stamping foils market can be segmented into paper, cellulose acetate, polyester, polypropylene, PET, and polythene. Polyester is estimated to be the largest segment of the hot stamping foils market between 2018 and 2026. The segment is expected to maintain its dominance throughout the forecast period. The segment has, however, reached maturity and hence, it is likely to witness sluggish growth from 2018 to 2026. Paper, polypropylene, and PET are some of the carrier film types which are increasingly being adopted due to their recyclable nature. Hot stamping as a process is quite eco-friendly, as it does not involve inks and the paper carrier used can be easily re-pulped. The cellulose acetate segment is estimated to witness rapid growth during the forecast period. Hot stamping foils with cellulose acetate carrier films are primarily used in hot stamping of textiles and hot stamping on clothing labels. The polythene segment is likely to witness decline in the demand, due to increasing focus of consumers on using eco-friendly materials as carrier films. Polythene is non-biodegradable and it causes pollution. Hence, the segment is likely to lose market share to other segments during the forecast period. In terms of labels & packaging, the global hot stamping foils market can be segmented into narrow web labels, wet glue labels, folding cartons, flexible packaging, and corrugated packaging. Narrow web labels is the largest segment of the market. It is also the most diversified application technology. Wet glue labels is the oldest application technology. These labels are primarily applied on wine and beverage bottles made of glass. However, the market is expected to witness shift from wet glue labels to narrow web labels during the forecast period. Hot stamping is carried out on corrugated packaging for gift boxes, perfumes, wines and liquors, and cosmetics to impart shine to surfaces and enhance appearance of the packaging. Corrugated packaging is anticipated to be the rapidly expanding segment of the hot stamping foils market during the forecast period. Folding cartons and flexible packaging segments are projected to expand at a significant growth rate between 2018 and 2026. Geographically, the global hot stamping foils market can be classified into North America, Europe, Asia Pacific, Middle East & Africa, and Latin America. Europe is estimated to be the largest market for hot stamping foils across the world from 2018 to 2026. Asia Pacific and Latin America are likely to be rapidly expanding markets for hot stamping foils during the forecast period. Growth of the market in Asia Pacific and Latin America can be attributed to growth of the packaging industry in these regions. The market for hot stamping foils in Europe and North America is likely to witness sluggish growth, as these are already mature markets. Manufacturers in developed regions have limited presence in Middle East & Africa and Latin America. These two regions are projected to offer lucrative growth opportunities to manufacturers in the next few years. Strengthening distribution channels in these regions is anticipated to help these companies enhance their footprint in the near future. The global hot stamping foils market is quiet fragmented with a large number of local players operating in regional markets. Key players profiled in the report are API Group, Kurz, UNIVACCO Foils Corporation, Crown Roll Leaf Inc., Foilco Limited, Nakai Industrial Group, CFC International, Washin Chemical Industry Co., Ltd., and K Laser.